Did you know, that no matter how good your car is, no matter how many tune ups you’ve given it, you’re dead in the water without a good battery. The workers at Elkhart Mechanics can serve all your battery needs. From checking the voltage, the age and general condition of your battery to making sure you have the proper size, CCA (cold cranking amps) to fit your vehicle. A lot of people overlook the CCA, which the higher the number means the better it will start in the cold. Also you need to make sure your battery is properly mounted in the vehicle. If you’re in a crash, anything that isn’t bolted down becomes a projectile. Batteries are also heavy and you don’t want it flying around. If you try to turn on your car, but it doesn’t start, the first thing you suspect is usually your battery. When everything in your car is functioning well, the alternator charges the battery whenever the engine is running. When your alternator works properly, the battery lasts a long time, but when it does not work well, your battery will wear out quickly. If your battery is getting low, you might hear a whining sound when you turn on the car. If your battery is not charged, you can give it a temporary charge with jumper cables, but this is not a permanent solution. It will only last until the next time you turn your car off, which means that you will need a jump start every time you drive until you can get your car to the mechanic. Older batteries are open on top and you can see the cells surrounded by distilled water. You can add more distilled water when necessary to make sure that the battery does not dry out and rust, thus making it last longer. Most new batteries do not allow you to add water. Sometimes auto parts stores will sell you a new battery when that is not what you need at all or when it does not fix the root cause of the problem. If you bring your car to Elkhart Mechanics, we will do everything possible to get to the bottom of your vehicle’s battery problems. Many battery problems are actually caused by problems with the alternator or starter. Just because your car might have several parts that could use maintenance, we will not take that as a free pass to start making expensive repairs. We will always check with you first before we repair or replace anything. It is the Elkhart Mechanics promise. ​If you are like a lot of people, chances are good that there are few things that are more frustrating than to be done with a day at work, a day of shopping, or some other event, only to get into your car, turn the key, and instead of your engineroaring to life, all you hear is "click." That's all. Just "click." In most cases, that means that your battery is dead. And if that is the case for you, it's time to call Elkhart Mechanics. At Elkhart Mechanics, we never forget that we're in the business of keeping you on the road, and whenever we are responsible to a client for doing that, as long as they are not on the road, we are providing less than the top quality of service, which is not in our credo. Your car battery is one of those things that although small can create major problems when keeping your car going. You probably remember the last time you had a problem with your battery. It doesn't matter how old or how new that battery was. If there was something wrong with it, you didn't get anywhere, which is a serious matter, whatever you happen to be doing. It doesn't matter where you are when you experience a battery problem. 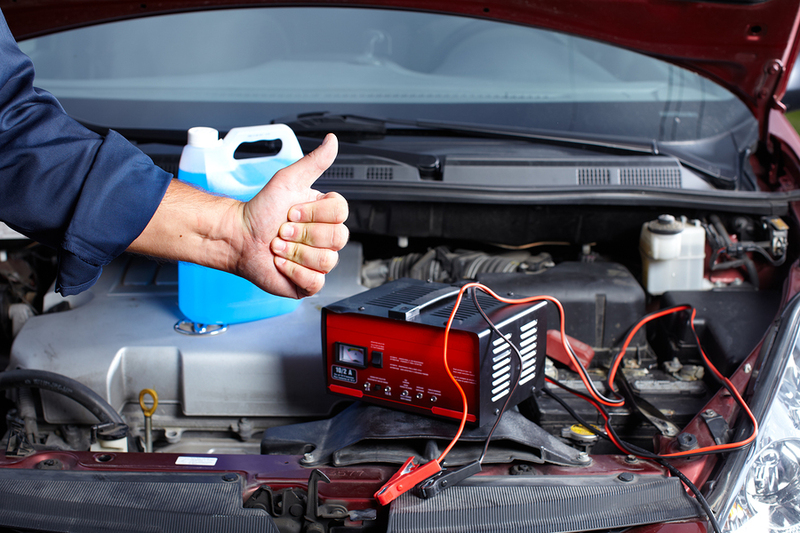 We will deliver complete car battery service at home, work, or anywhere else. We provide complete car battery replacement service Elkhart, IN, wherever it is needed. At Elkhart Mechanics, we provide complete battery care, not just part of it. We provide car battery delivery and installation, wherever you might happen to be. This means complete car battery replacement service at your home. And wherever we might give you service, we won't just recommend a new battery unless that is what is called for. We understand that unless a new car battery is called for, car battery service is usually all that is needed. Car battery replacement cost is often high. That's why we will thoroughly check your battery to make sure that is what is needed, not just the quickest fix. We can also handle complete car battery installation. we're not just in the business of car battery sales. In fact, there's nothing about car batteries that we can't handle for you, and that we're not the best at. So whatever your car battery replacement Elkhart, IN is, call us. At Elkhart Mechanics, we know car repairs better than anyone else in the area. That's why, when it comes to the effective service of your car, you should make your first stop at Elkhart Mechanics, where you can get the highest quality of car repairs, whether it be for car batteries sales, service, and installation. We handle the job. Call us today to see how we might be able to help you. You can rest assured that when you get service or a repair at Elkhart Mechanics, you are receiving the highest quality of car repairs available. Whatever it might happen to be, we have you more than covered.